Full membership, available to both the absolute beginner or to those who have completed a course or trial lesson, is the least expensive way to learn to fly. The annual subscription and flying charges are modest and there is no charge for instruction. 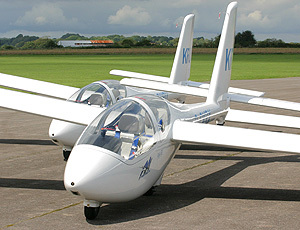 Of course, members are expected to play their part in the varied and enjoyable activities of airfield operation, as the Cotswold Gliding Club is a voluntary organisation, run by the members. For beginners our solo package offers a year's membership and a maximum of 100 winch launches up to your first solo flight for just £895. 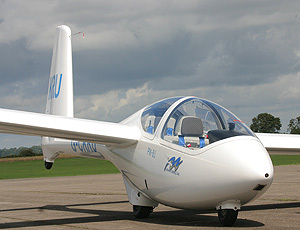 Alternatively you may wish to join as an ordinary member and pay as you go for your flying. As a guide people generally go solo after 50 to 100 launches and usually the younger you are the fewer launches you will require. Look at the membership fees and charges page to compare prices. If you would like an introduction to gliding before joining the club then why not take one of our one day courses or a shorter trial lesson. If you join the club after taking either of these you will receive a generous discount on your first year's membership fee. For those people who are unable to commit themselves to a full flying membership you can join as an associate member. This gives you full use of the clubs social facilities and up to 12 launches a year at the standard club rate with a club instructor. Although you will be able to fly the glider yourself during these flights and will be given appropriate instruction, we are unable to give instruction to solo standard for associate members. When you join the club you will be allocated to one of six operations teams. The teams set up the airfield ready for flying each morning and operate the lauchpoint during the day. Generally you will be expected to help out for one weekend day (or two half days) every six weeks. There is flexibility in the system with other members covering for unavoidable absence and swapping between teams is also possible. The other members of your team will train you in the various activities such as unpacking the hangar, moving gliders about the airfield, attaching launching cables, signalling and log keeping. The teams allow you to get to know a group of people and become familiar faces to you at the airfield. The instructors, who work a three week rota, will also get to know you quickly.